Mr. Media is recorded live before a studio audience of recovering former cathouse dwellers… in the new new media capitol of the world… St. Petersburg, Florida! 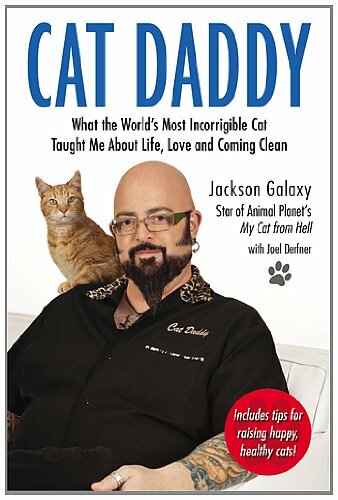 Order ‘Cat Daddy: What the World’s Most Incorrigible Cat Taught Me About Life, Love, and Coming Clean’ by Jackson Galaxy, available from Amazon.com by clicking on the book cover above! Maybe “hate” is a strong word. The problem is I’m allergic to them. I can think of many aspects of my life that would have turned out differently if it were not for the adult onset of cat allergies. Dinner parties I would not have had to leave early due to puffy, red eyes. Intimate social encounters uninterrupted by wheezing and breathlessness. So I can’t be around cats. And, I suppose, because of that, I do hate cats. To me, then, all cats are sent from to us from Beelzebub. Which is why I instantly accepted the opportunity to interview rock guitarist and cat wrangler Jackson Galaxy on the occasion of his new Animal Planet mini-series, “My Cat From Hell.” The show debuts Saturday, May 7 at 9 p.m.
I’d probably want to watch the show just for the spectacle of Galaxy himself – the shaved head, goatee and cat tattoos are quite a sight to behold, even before we meet the various felines on steroids. Order ‘Catification: Designing a Happy and Stylish Home for Your Cat (and You! )’ by Jackson Galaxy and Kate Benjamin, available from Amazon.com by clicking on the book cover above!